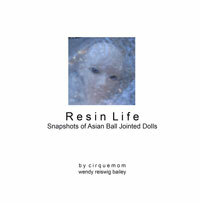 Available now, this 80-page book showcases a series of full-color photographs of Asian Ball-Jointed Dolls caught in brief, candid moments of Resin Life. Featured in the book are the exquisite, fully-customized ball-jointed dolls from Asia, including those manufactured by Angel of Dream, Bobobie, Doll In Mind (DIM), DollZone, Elfdoll, Parabox/Obitsu, and Souldoll. All of the dolls featured are from the personal collection of Wendy Reiswig-Bailey (known as Cirquemom in online doll circles). The term "Resin Life" is used in the title, because once the dolls have arrived, are painted, eyed, wigged, and clothed, each one takes on a spirit, soul, and identity of his/her own. Often, the doll's personality evolves to become completely different from what was initially envisioned by their purchaser. Many who collect these addictive dolls realize that not only do they exhibit an Asian aesthetic in their appearance, they also seem to embrace more of an Asian attitude toward dolls and objects in general. That being, to most of their owners, the dolls become "real", the 3-D interpretation of virtual life. There are a number of Websites and Forums for information or communities. The one I use the most is the forum at Junkyspot: www.junkyspot.com- which is where the majority of my dolls were purchased. Another excellent resource for information about nearly every BJD made is the Den of Angels website: www.denofangels.com. Wholesale inquiries welcome. Please contact me if you are interested in booking a personal appearance at your local bookstore, doll or book club, school or service group in the California/Oregon/Western Washington area. Please check back as more information gets added to the site.